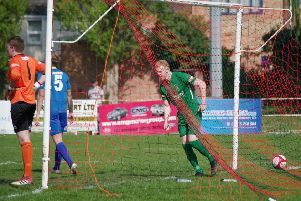 Brighouse Town lost vital ground in the hunt for an Evo-Stik NPL First Division North play-off place when they lost 3-2 at Farsley Celtic yesterday. James Walshaw scored a winner with five minutes left as the hosts avenged a 2-1 defeat at Hove Edge in mid-October. Town drew first blood when new signing Ben Wharton opened the scoring on 15 minutes after the ball had broken to him in the penalty area. Farsley turned it round with two goals in two minutes before half time, from Richard Marshall and Ryan Watson, and when Brighouse’s Jack Stockdill got a straight red card on the hour, things looked bleak for the visitors. However, Paul Quinn’s side were gifted an equaliser with 16 minutes left, Farsley scoring an own goal following a shot from Leon Osborne, only for Walshaw to have the decisive say. Farsley are fourth in the section while Brighouse, who host lowly Prescot Cables next Saturday, are ninth.